For my first physical experiment, I recruited my roommate. She just recently purchased quite a number of books to add to her collection, and I figured it would be a great time to see how she organizes them. Having had my share of experiences shelving books, I knew she’d come across a number of issues especially considering that first, she doesn’t have a bookshelf and second, she has a variety of sizes and shapes of books. Her immediate instinct was to put her books on the floor. She organized them, left to right, from largest to smallest along the edge of the wall. Problem solved? Wrong. The books at the end would not stop slipping and falling, leaving room for the other books to topple sideways. 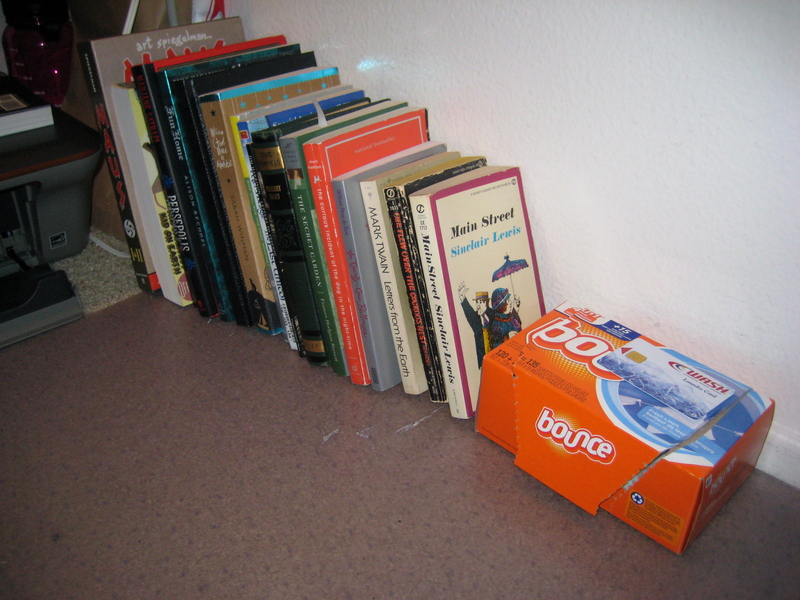 That’s why the box of Bounce is there, acting as a bookend. Without the box, gravity would certainly take initiative and cause the books to slip and fall. Another factor that plays heavily alongside gravity is friction. Friction is the resistance that takes place when two objects’ surfaces run across each other. In this example, my roommate’s books have been placed on top of a plastic material. If they had been placed on a material such as carpet, there would be greater friction and less reason for her to need the makeshift bookend with a box of dryer sheets. It’s the meager amount of friction between the bottom of the books and the plastic surface that causes them to constantly slide and topple over. For a bookshelf to sustain a substantial amount of books, it must break gravity and friction’s forces. Therefore, it only makes sense for the standard bookshelf to be set against a wall with side panels to hold the books in place. The generic bookshelf design is so engrained into our lifestyles, that it’s hard to imagine it being in any other shape or form. My roommate’s decision to organize her books the way she did only emulates the standards that society has adapted over time. It’s practical and most logical in terms of it functioning exactly as it should.